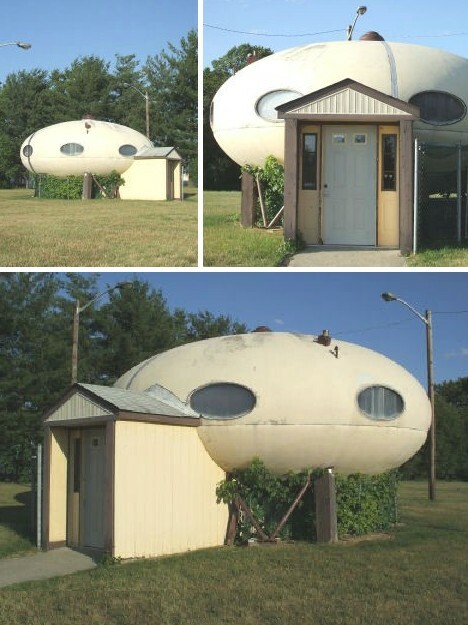 Evoking images of flying saucers, interplanetary space pods and science fiction futurism, the Futuro house offered homeowners a chance to live in the future without ever leaving their front yards. 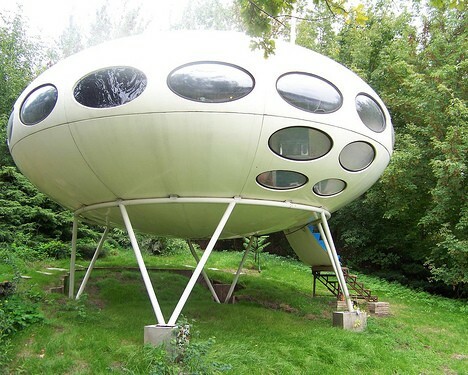 Finnish architect Matti Suuronen designed the Futuro house in 1968 but only 96 of the fiberglass-reinforced polyester plastic pods were produced over a 5-year period – killed by the 1973 Oil Crisis that tripled the price of plastics. 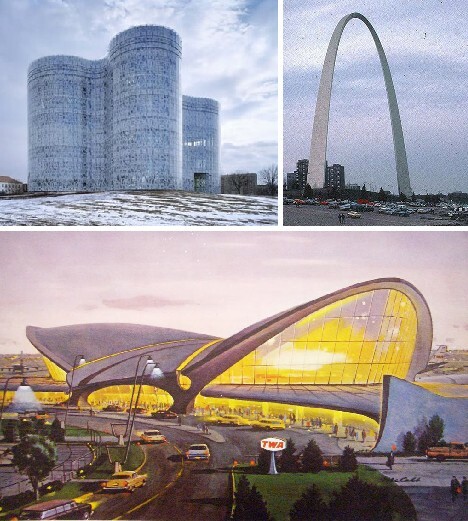 Today, roughly half of the ellipsoid structures have been accounted for and their iconic design has made them a favorite of pop culture collectors, retrofuturism fans and all those who appreciate the impact of 1960s Space Age style. 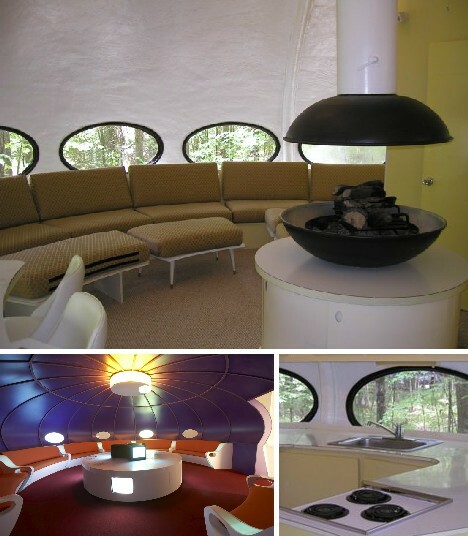 The Futuro house was the brainchild of Matti Suuronen, one of a number of Finnish architects and designers who garnered wide recognition for futuristic, post-modern structures and consumer goods. Along with Alvar Aalto, Eero Saarinen and Viljo Revell, visionary architects like Suuronen put Finland on the map when it came to futuristic, and, well, fantastic expressions of the post-modernist ethos. 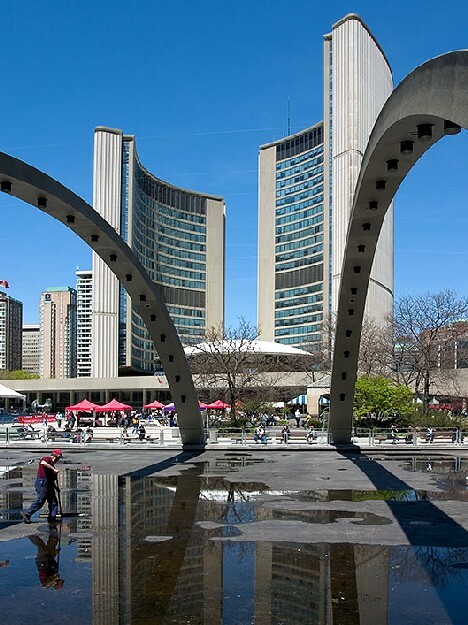 Explaining his architectural philosophy in a 1957 speech, Alvar Aalto said, “We should work for simple, good, undecorated things, but things which are in harmony with the human being and organically suited to the little man in the street.” Toronto’s city hall, which was designed by Revell and opened in 1967, is shown above. Airport terminals and city halls are one thing, homes for the “little man” are quite another. 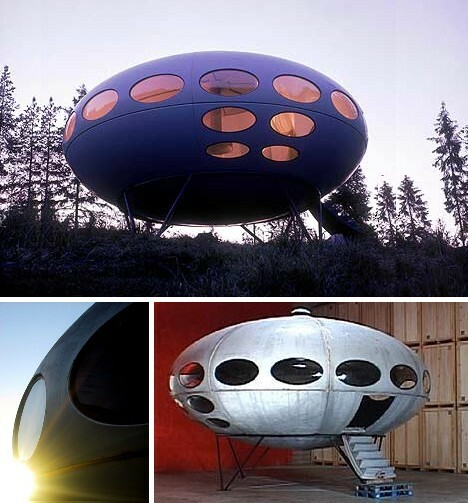 That’s where Matti Suuronen comes in, along with his iconic Futuro house. 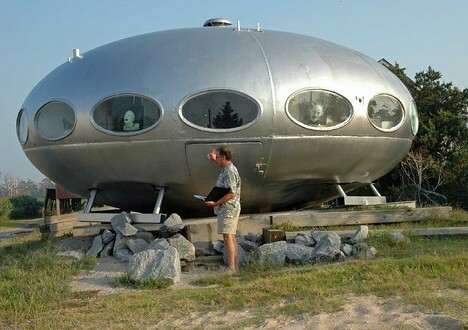 Measuring 10 feet (3 meters) high, 26 feet (8 meters) in diameter and perched upon a sturdy 4-legged steel base, the Futuro house could house a very small family in a pinch or several modules could serve different domestic functions. 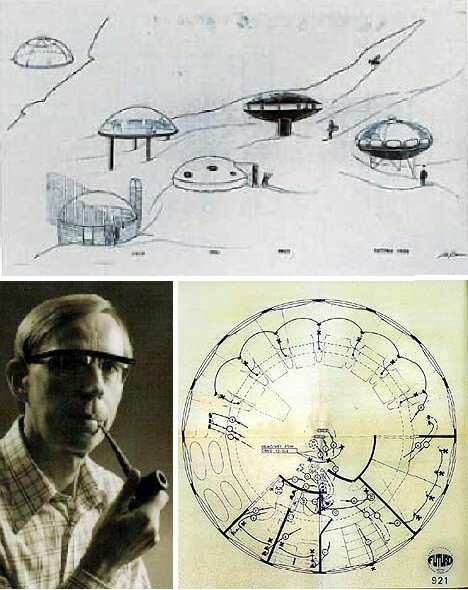 The basic design is a simple one, as can be noted by the consistency of Suuronen’s vision from the very first hand-drawn renderings. The finished product proves the practicality of Suuronen’s design. 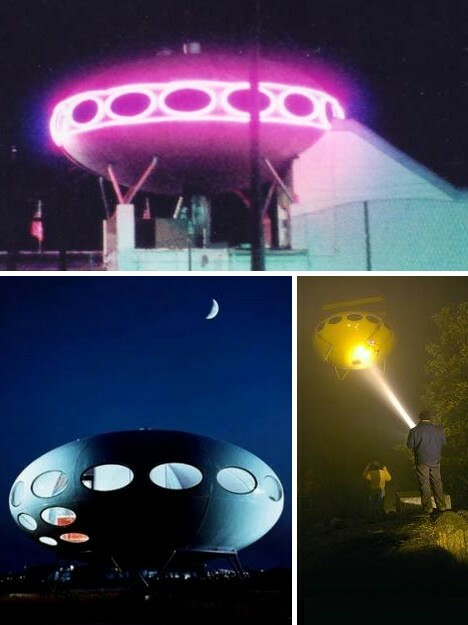 The shape and form are timeless – with its “egg on an egg cup” format, the Futuro house looks as good today as it did in 1968. 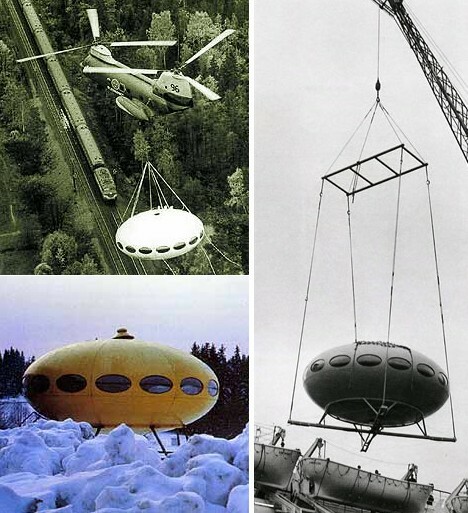 The Futuro house wasn’t built like other houses of the day; instead it was prefabricated in a factory. The first Futuro prototype, painted white, exited the Polykem plant in Hiekkaharju, Finland in late March of 1968. Production models (the first one being painted yellow) began coming off the line soon after. 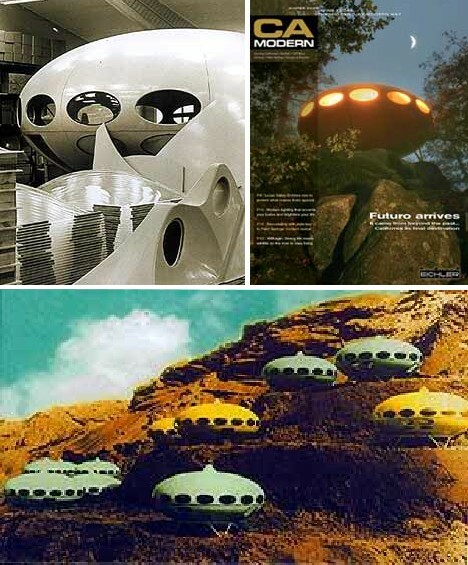 Originally intended to be prefab ski cabins, Futuro houses were basically picked up at Polykem and set down on the desired plot of snowy land. Erm, it helped to have either a helicopter or a crane – or both – to do the picking up and dropping off. 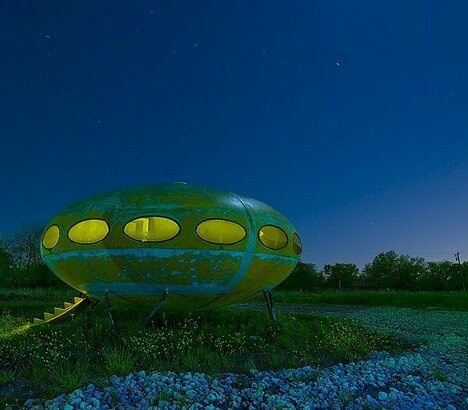 The otherworldly appearance of the Futuro house makes it a popular subject for photographers. 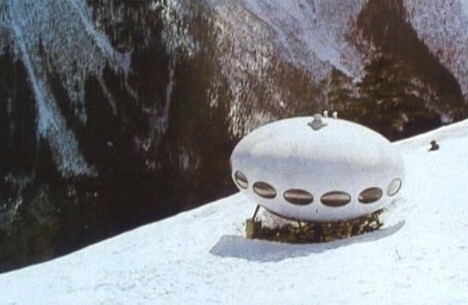 Finding a suitable scenic vista is often made easier by Futuro owners for whom the UFO look is to be accentuated to the max. 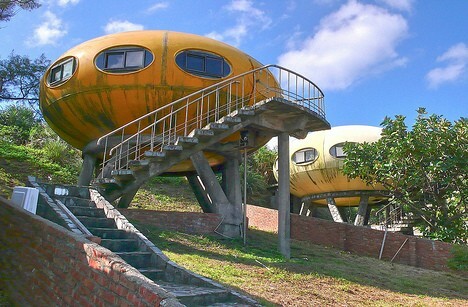 Some Futuro houses came with an extra set of 2 or 4 windows, which are undoubtedly attractive and probably help to reduce any feelings of claustrophobia. 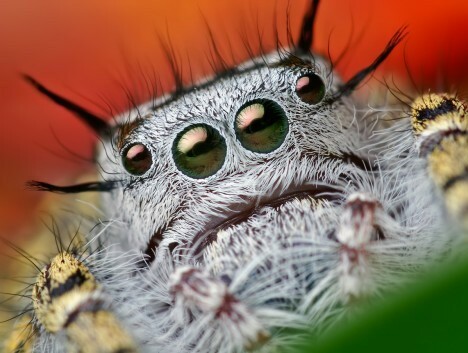 Arachnophobia, not so much. It may have looked odd on the outside but from inside it looked even… odder. 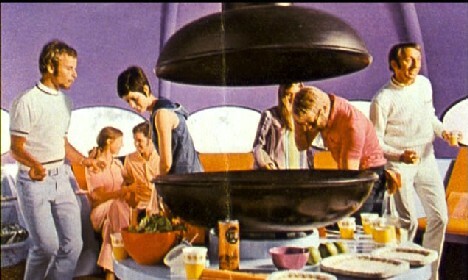 Futuro promotional brochures from the late 1960’s attempts to portray regular (ok, very groovy) people in average situations – in a very un-average home. 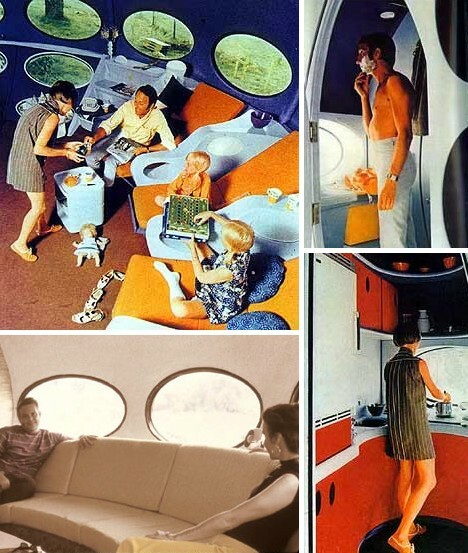 Photographic representations from a more recent date show off the Futuro’s spacey and surprisingly spacious interior. 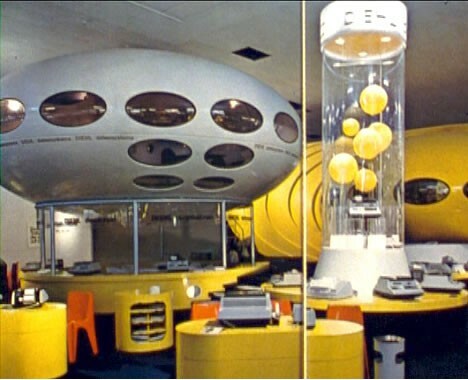 An important – critical, actually – facet of the Futuro’s design was the airliner-style extendable ramp that unfolded out from the home’s outer hull. Once homeowners climb aboard and reel in the ramp, the Futuro exposes a practically seamless exterior that not only looks great, but also enhances security. 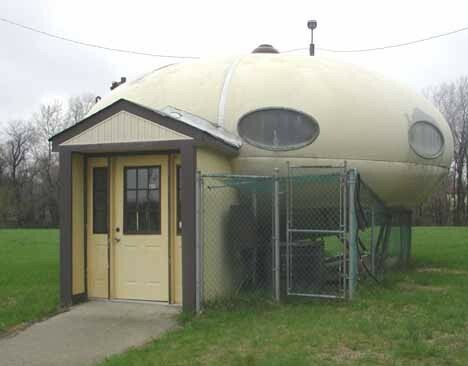 Sometimes even the coolest designs fall prey to their surroundings, and that’s the case with this Futuro house located in Franklin Park, NJ. Judging from the verdant undergrowth the home has been in place for some time, though it’s unknown when the owner decided to heck with the entry/exit ramp and built the incongruously traditional front foyer. I’m not here to judge, though… what happens in Jersey, stays in Jersey. 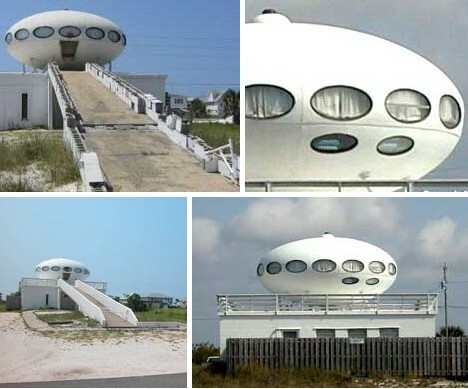 The so-called Spaceship House is currently the Pensacola Beach Preservation and Historical Society’s headquarters. 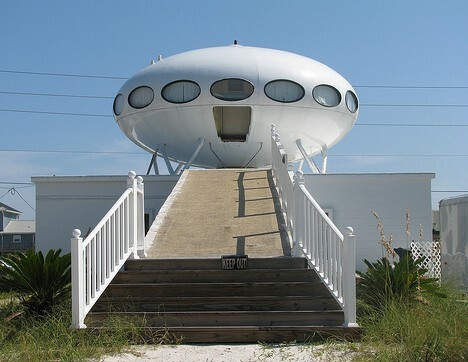 Having survived Hurricane Ivan and Hurricane Dennis with nary a scratch, the southern Florida Futuro house sits atop a more traditional blockhouse structure with a permanent ramp to ground level. 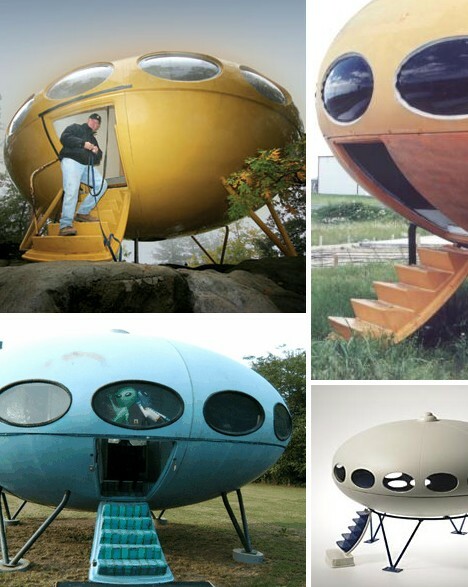 Here are some other views of classic Futuro houses uncluttered by later add-ons and appurtenances. With 300 square feet of living space inside they indeed may be small, but wouldn’t it be cool to keep one in the backyard, maybe as a home theater? 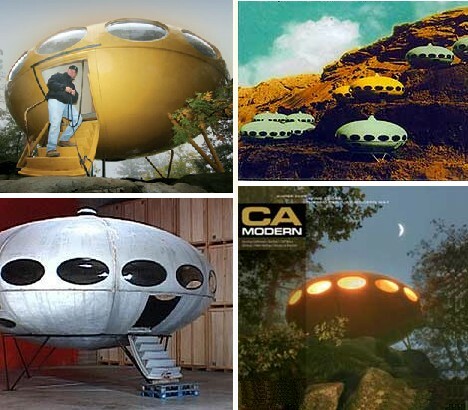 This video provides a deeper look at the Futuro house along with a text narration of the Futuro’s story from beginning to end. It’s accompanied by complementary cool mood music, “La Femme d’Argent” (The Silver Lady) by Air. In 1998, Finnish film director Mika Taanila made a documentary film titled “Futuro – A New Stance For Tomorrow”. If the video piqued your interest than this film is a must-see. 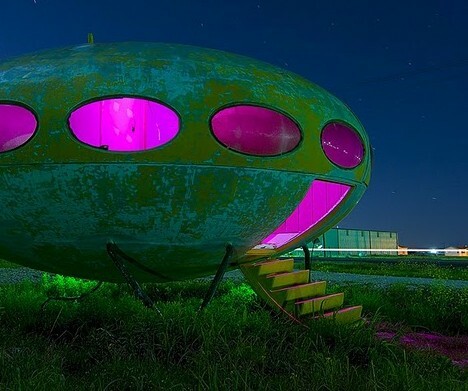 The Futuro house epitomizes Space Age style, a period of optimistic, futuristic aesthetics that roughly coincided with the first great burst of space exploration. From the launch of the Soviet Union’s Sputnik satellite in late 1957 to the end of the U.S.’s Apollo moon missions in 1972, earthbound designers let their creative spirits soar into orbit – and we gladly went along for the ride. 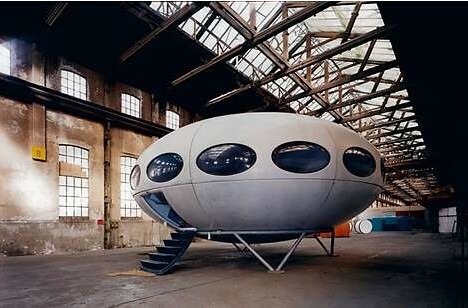 Though ultimately short on practicality, the Futuro house satisfied our longing for better lives in a brighter future!